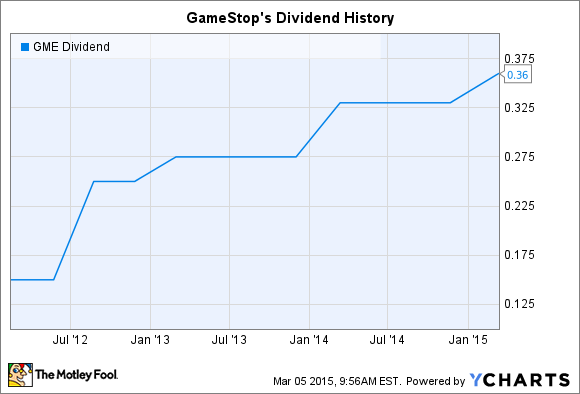 This high-yield retailer just boosted its quarterly dividend payout. GameStop(NYSE:GME) shares are back above $40 after the video game retailer announced a hike to its dividend this week. The annual payout jumped to $1.44 per share, up 9% from last year. This raise follows big hikes in each of the last two years. All told, the quarterly dividend has more than doubled since management initiated it back in Feb. 2012. 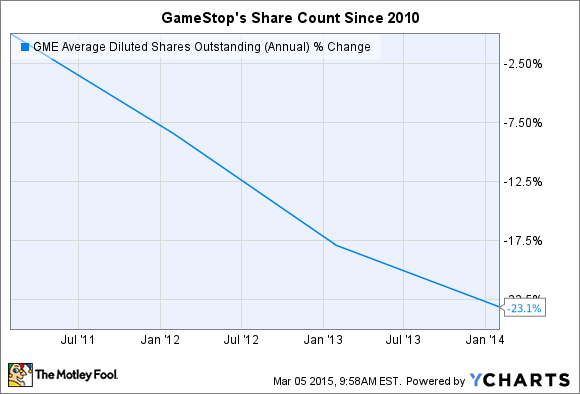 But GameStop has been even more aggressive buying back shares. Since 2010, management has shelled out a total of $1.64 billion for share repurchases, representing over 25% of its current market capitalization. The dividend raise could suggest a strong fourth quarter earnings report later this month. After a surprisingly weak third quarter, the retailer booked solid growth over the holiday shopping season. That was mainly thanks to hit video games like Activision Blizzard's Call of Duty: Advanced Warfare and Take Two Interactive's Grand Theft Auto V. Management said in January that the momentum should lift this year's results, too. "During the holiday period, consumer demand for video games was strong ... We expect that trend to continue into the first quarter," said CEO Paul Raines.